Sultans lamenting the lack of BMW M7 action, whip out your AMEX Centurion cards. Bavarian tuning shop and BMW partner Alpina Burkard Bovensiepen (just Alpina, thanks) will show its B7 sedan at the Chicago show next week. It'll be the US debut for the tuner 7-Series, which has been massaged up to 500 hp and 516 lb-ft of torque, via supercharging. That means unlike the M5, the B7 is a lowdown torque monster, peaking at at 4,250 rpm (compared to the V10's 383 lb-ft at 6,100 rpm). It also gets a sport-tuned suspension with active roll stabilization, signature 20-spoke wheels and a functional aero kit. A single low, low payment of $115,695 will get you one of the 200 B7s set to be produced this year. Committed to developing the best performing vehicles in the luxury market, BMW along with ALPINA have created a special high performance version of BMW's 7 Series luxury sedan. The 2007 BMW ALPINA B7 brings together the luxury, pioneering design, and advanced technology of the 7 Series Sedan with the scintillating performance of a supercharged, 500 horsepower V-8 engine. 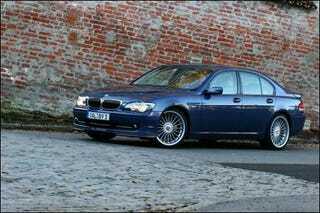 To power the BMW ALPINA B7, ALPINA specially developed a higher-performance version of BMW's 4.4-liter, 90-degree V-8 engine and mated it to a 6-speed automatic transmission featuring steering wheel mounted shift controls. The motor produces 500 horsepower at 5,500 rpm along with maximum torque of 516 lbs.-ft. at 4,250 rpm, and propels the B7 from 0-60 mph in a mere 4.8 seconds. ALPINA 21-inch wheels carry Z-rated performance tires, while the sport-tuned suspension includes Active Roll Stabilization. The B7 aerokit includes a rear spoiler to improve stability, handling, and performance at high speeds. With this new model, BMW will raise the benchmark for the segment in terms of performance, refinement, technology, and luxury. Approximately 200 US-version cars are planned for the 2007 model year. The BMW ALPINA B7 has a manufacturers suggested retail price of $115,695.